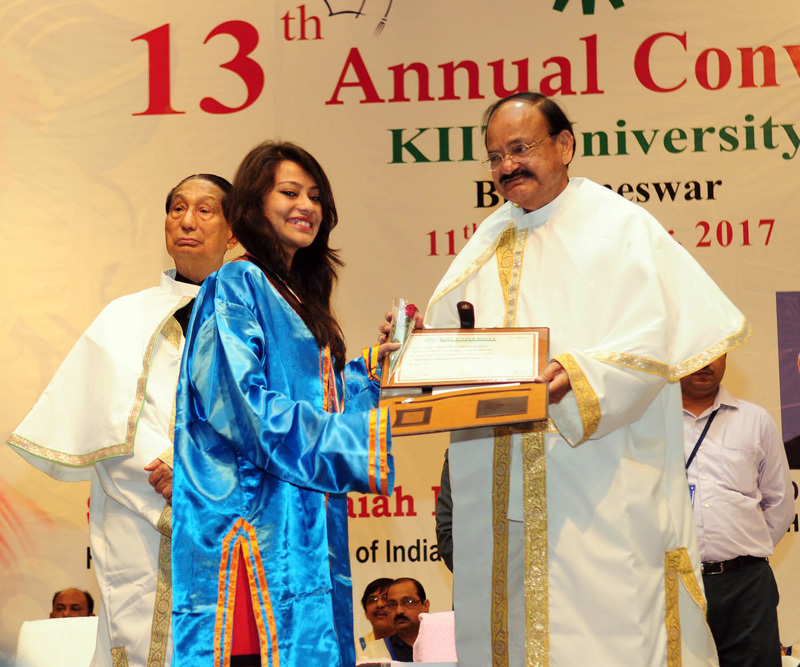 The Vice President, Shri M. Venkaiah Naidu giving away degrees to the Students, at the 13th Annual Convocation of Kalinga Institute of Industrial Technology University, in Bhubaneswar on November 11, 2017. The Governor of Odisha, Shri S.C. Jamir is also seen. Bhubaneswar: The Vice President of India, Shri M. Venkaiah Naidu has said that Google can’t replace Guru. He was delivering the 13th Annual Convocation of Kalinga Institute of Industrial Technology University, in Bhubaneswar, Odisha today. The Governor of Odisha, Shri S.C. Jamir and other dignitaries were present on the occasion. The Vice President said that education occurs in the classrooms, the sports fields, at home, through internet and the media and multiple daily interactions with people around us. He further said that all formal, non-formal and informal channels contribute to making us educated. Learning new skills and acquiring new knowledge is vital in today’s knowledge economy, he added. The Vice President said that upgrading our competence, updating our knowledge and adapting to a rapidly changing work environment is the need of the hour. He advised the students to think outside the box and collect as well as connect facts. He further said that you must acquire and utilize vast resources that are now more readily available than before: information and knowledge and you must strive to be the best in whatever field you choose, he added. The Vice President said that accessing, adopting, adapting and assimilation of new ideas has been India’s strength. He further said that we must revive and adopt this inclusive, welcoming world view. That is the best way to grow and bring back the lost glow on the face of our motherland, he added. “I am indeed privileged to address the bright young generation of this great country. I would like to thank KIIT University and its founder Dr. Achyuta Samanta for creating such a wonderful University and Kalinga Institute of Social Sciences (KISS). I am told that KIIT is a Grade ‘A’ university which has been nurturing talents over the last twelve years. Convocation is always a special day for students, parents and the faculty members. Students look back at the years they have spent at the University, learning new things, making new friends and gaining new insights on the world. They also look forward to the graduation and beyond. The faculty members feel proud of the students’ achievements and so do the student’s parents. It is a moment of celebration. It is a moment of glory and satisfaction. It is a moment of looking forward to a hopeful future. I congratulate each one of the students and the faculty members as well as their parents. Education occurs in the classrooms, the sports fields, at home, through internet and the media and multiple daily interactions with people around us. All formal, non-formal and informal channels contribute to making us educated. Teachers play a pivotal role in educating the society. Google can’t replace Guru. Dear students, you are fortunate to be a part of the educated India. You are among the 25% of our country’s youth who are enrolled in institutions of higher education. I compliment you on successful completion of the courses you have pursued in the University. I hope you will continue to learn even after you leave the University. Learning new skills and acquiring new knowledge is vital in today’s knowledge economy. Upgrading our competence, updating our knowledge and adapting to a rapidly changing work environment is the need of the hour. To do this, you must keep your eyes, ears, minds and hearts open. You must learn to discover and innovate. You must know how to think outside the box and collect as well as connect facts. You must acquire and utilize vast resources that are now more readily available than before : information and knowledge. You must strive to be the best in whatever field you choose. Seers have also said “Adopt good practices, do not neglect welfare”. Accessing, adopting, adapting and assimilation of new ideas has been India’s strength. We must revive and adopt this inclusive, welcoming world view. That is the best way to grow and bring back the lost glow on the face of our motherland. We cannot be a Vishwguru if we do not connect with Vishwam and contribute to the welfare and well being of our countrymen and the people on this beautiful planet. Your university is located in the historic land of Utkala that transformed one of India’s greatest emperors – Ashoka – from being a ferocious king to a pious, development oriented monarch. We need this kind of transformation today – from needless wars to blissful harmony between people. Education, in its broadest sense, should foster this transformation. “Education is that which liberates” according to our ancient visionaries. It should liberate us from narrow, tunnel vision. It should liberate us from prejudices, hatred, intolerance. “Vidya dadaati Vinayam”, Education should make us humble, should make us patient and make us good listeners. I thought I should share some thoughts on this happy occasion as you move on to shape your lives. Once again, my felicitations to Dr. Samanta who has set up this excellent centre of learning. My sincerest congratulations to the faculty members for their tireless commitment to the noblest of causes. My affectionate greetings and good wishes to all my young friends who are graduating today and to many more who are studying in this University. May the Lord Tribhuvaneswara guide all of us towards energetic action with enlightened minds and enthusiastic hearts.